I say unit tests are code like any other code. As such, they deserve to be refactored and kept clean. For SonarLint to behave the way I want, which is to treat any file whose name ends in ".java" as code, I have to clear the regex. Legacy Code: Characterize or Test Protect? Characterization Tests: a suite of tests that I build against legacy code that uses sufficient representative inputs to convince myself that I have characterized the behavior of the object I am testing. This suite also documents the behavior. Test Protecting: building a suite of tests against legacy code that covers the object under test sufficiently that I am confident that the suite protects me from inadvertently changing the object's behavior during refactoring or when I add features. One thing that is interesting to me is that the exact same suite of tests can both characterize and protect an object's behavior. I was running a workshop today and introducing the concept of test protecting. Here are the steps I introduced today. If you are new to test protecting, they should be a good starting point. If you've done some test protecting, I hope you'll find some new nuance to your understanding. If you're already awesome at test protecting, maybe you'll want to teach from my steps, or comment with your insights about test protecting. Select a class to protect. Legacy code, by one definition is code that doesn't have tests, so it follows that a legacy class won't have a test corresponding class. Create a test file with a name and location that follows your unit testing framework's conventions. Choose a public method to start with. Don't protect private methods that are difficult to test through public methods. Refactor the class so that it is easier to test. Use a testing tool that allows you to test non-public methods. Protect as much as you can in a reasonable amount of time, assess risks posed by unprotected code, then decide on your next action. The only answer that I am comfortable with is number 6. Write a test that exercises the method you selected. If you are at least somewhat familiar with the behavior of the method you selected, think about edge case inputs and happy and sad path inputs. Choose one to start with. Some devs like to start with edge cases, some like to start happy or sad path. I'm not sure it matters. Give your test an absurd assertion against the result. Run the test so it fails. If it doesn't, check your assumptions and look for mistakes in your exercising of the method or in how you wrote your assertion. Fix the test so it passes. Examine the test coverage of the method you are exercising. If your coverage tool doesn't automatically run when you run tests (why doesn't it? ), then run your coverage tool. Find which lines of your exercised method are not executed by your first test. If there are none, your method is test protected. Write another test that hopefully increases coverage. Write a new test and give your exercised method new input data. Use inputs that, based on whatever understanding you have of the method so far, will exercise a non-covered line. Sometimes the name of the method will give you an idea, sometimes you will have gleaned some tentative understanding by scanning the implementation code while looking at coverage, and sometimes you still won't have a clue. Pick new inputs however you can and run your test. Get the new test passing. You might have needed to write a green test in order to increase the method's coverage. That's ok. In test driving, a test that doesn't go red before going green is worthless and time-wasting at best and possibly dangerous at worst. But in test protecting, such a test is only worthless if it does not add to the method's coverage. If your new test didn't increase the method's coverage, change your inputs until it does. This is another difference from when we test drive. When we test drive, we choose a set of inputs that fail and implement code to make it pass. We change the inputs only if the ones we chose did not make the test fail. Check the coverage of your method again. If you have not covered all the lines in the method, jump back to "Write another test that hopefully increases coverage." If you have covered all the lines in the method, start over again with"Choose a public method to start with." If you've covered all the lines in the class, you have test protected the class. Congratulations! Make sure new tests are run in CI. If there are already other test classes in your project, your continuous integration server may already be configured to run tests in all test classes. If not, adjust your CI server's configuration to be sure that it runs your new tests. Kick off a build and inspect the build output to be sure your new tests ran. If you didn't cringe when you read that, I get it. In a way, it is a clever nod to all the happenings related to the recent North Carolina bathroom law. But I cringed when I heard it, and I cringe each time I read it again. Unfortunately, that comment is hurtful. Would a transgender man feel welcome hearing that? I can't imagine one would. I'm sure that the comment was not intended to be hurtful. But if a transgender man heard it, and I can't be certain that one did not, I expect it would have a hurtful impact. And if we want a better workplace and a better world, I believe we have to take responsibility for the impact of our actions, not just our intentions. I believe everyone wants a fun work environment, and jokes can certainly be part of that. But I'm hoping that we can create cultures that push women and members of marginalized groups out of IT less. When someone is outnumbered in a setting, it can be hard to speak up about what feels OK and what doesn’t, especially if the rest of the group seems to (even if silently) condone something. I understand - rocking the boat about culture can be a risk to employment. As white, heterosexual men, we are probably not experienced with what can feel hurtful to people different from us. I try to honor and believe people’s life experiences. Even if I can’t see how something can be hurtful, I try to believe people when they say something is. All of this means that I try to avoid humor that is sexually charged, comments on people’s bodies, or touches on race, religion, sexual orientation, gender presentation, and other characteristics of members of marginalized groups. And if a joke like that slips out and I notice, I don't wait for someone else to point it out. I call myself out on it and acknowledge the possible impact, even though it wasn't my intention. 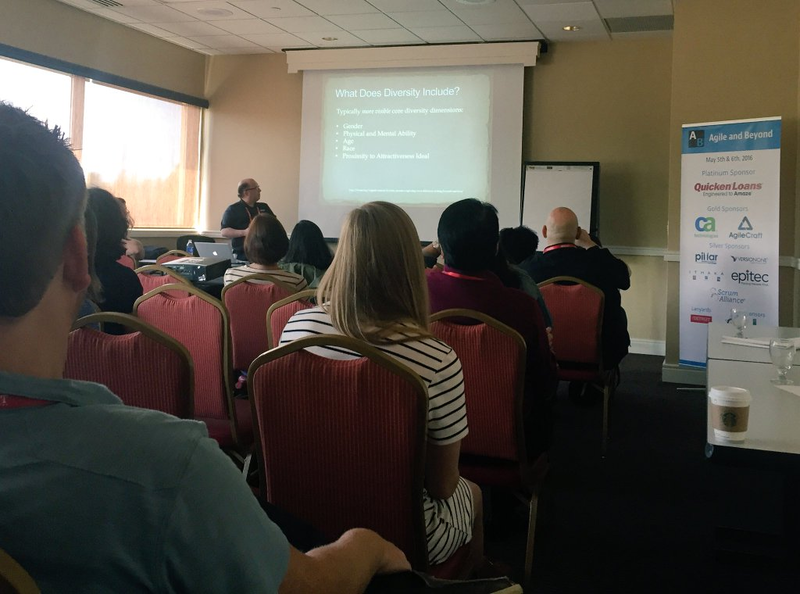 At Agile and Beyond 2016, I presented: "Why Should I Go See Another White Man Talk About Diversity in IT?" I spoke mainly about how women and members of marginalized groups are often made to feel unsafe or unwelcome at IT companies, usually without men realizing the impact of what we are doing. I've put my slides up (link below). If you are interested in the topic, please take a look. I have included many links to information and resources. A New Adventure - Same Employer, Same Client! For the last ten months, I have been a software developer on a high-functioning, reference team at a major enterprise client. The team is a great group of people, with solid processes, and has been delivering defect-free code and providing mission-critical business value since before I joined them. But my time as a member of that team has drawn to a close. Starting Monday, I will be moving within that same client to join the coaches in their Agile Center of Excellence. This new role will allow me to use more of my personal, social, coaching, and training skills, and will no longer involve creating production code on a cadence. I am really excited for my employer, my client, and myself. The change comes at a time when the development team is beginning a pre-planned size-down, so my employer has somewhere to place me immediately. My client can continue to benefit from my accumulated domain experience. Both will be getting their best value by paying for work that I excel at, and I'll be doing work that I have a deep passion for. I’m so glad to see another man thinking about hiring women and members of marginalized groups. I started a comment that post, but it became rather long, so I am posting it here instead. Read Jay's original post at the link above for perspective, although I hope that what I have written below stands fairly well on its own. I really like your post: "Hiring Awesome Developers (who happen to be women)". I've been thinking about how to write a "disclaimer" paragraph like your “Before you start” paragraph. You've covered many of my thoughts. I also try and acknowledge to people that I will make mistakes, and that I will accept the impact of my words regardless of their intention. Further, I won’t expect people to teach me about those mistakes (although I am totally open to it), and I will research on my own until I think I understand them. Another thing I find important is to amplify the voices of people in marginalized groups. I try to provide references to people who belong to the groups that I am speaking about. They are the ones whose lives are affected daily by these issues and they speak from the most authority. Your paragraph “A Possible Plan” addresses the so-called “pipeline” problem that results in too few minority and women candidates. But another reason that the makeup of companies is still disproportionately is that women are leaving STEM in large numbers. We need to make sure that our company cultures and environments are really fair to women and minorities and free from discrimination and bias before we bring in women and minorities, or we risk losing them and alienating them more. We can also examine our websites and job descriptions for wording and imagery that may discourage women and members of marginalized groups from applying. A simple example is a posting that looks for “ninja” developers who can “smash” technical problems — this aggressive language exclude women from considering themselves as a candidate. Finally, women tend not to apply for tech jobs unless they meet 100% of the criteria in the posting while men apply if they match 60%. I’m not sure what to do about that - maybe mention in the posting that not all criteria are required and avoid long lists of “nice-to-haves”. I wrote another post that has a more concise bullet-list of things I'm learning about diversity and the workplace. My employer, Pillar, produces a series of two-minute videos related to software development and the people skills needed to do it well. A video I made was just released. The title is: "4 Levels of Listening" and you can watch it here. I'd love to hear your reactions. learn to "check my privilege" and understand that I have privilege even if I had a hard life of poverty and abuse. If these ideas interest you, please follow the links above and come see me present at Agile and Beyond 2016 this May. Accountability - Do you do what you agree to do? How accountable are you for your agreements? When you say you are going to do something, do you do it? There was a time when I would say I would do things but then often not do them. For example: an acquaintance would suggest we go bowling and I would answer something like: "Yeah, I'll call you." But then I wouldn't call. Or when I first started in my career, a manager might ask me to provide a write-up on something and I might say something like: "I'll have it by the end of tomorrow." But that day and the next would pass, without any high-priority emergencies, and yet I wouldn't finish the write-up. Does that sound familiar? Do you have patterns like this? Maybe at work, or with a family member or spouse, or with friends or acquaintances? What was I doing when I said I would do something but then not do it? In both examples above, I might have had mixed feelings about doing the thing, or I might have actually meant to do it. But somehow I never quite managed to get it done. What did this behavior communicate to my friend or my manager? Perhaps it told them that I couldn't be counted on. Maybe even it said that I didn't put much value on things are that important to them. They might not have realized it consciously, but I suspect that they received a message that I didn't care very much about them. There came a time when I realized that not keeping agreements were weakening relationships with people in my life, at work and outside work. So I briefly decided that the answer was that I wouldn't commit to very much. So if that acquaintance suggested bowling, my new answer would be something like: "Yeah, maybe." Or with my manager, I would try to get away with telling him that I would complete the write-up "soon". But it quickly became apparent that this strategy wasn't strengthening relationships with people. These days, I have a strategy around agreements that strengthens relationships with people. When I'm asked something, I stop and consider the request seriously. I ask myself whether I want to agree to it, and whether I'm for sure able to commit to it. If both are yes, then I give the person a date or time when I will do it, and then I follow through. So, in the bowling example again, my answer would be "Yeah, that sounds fun! Can you do it this Friday?" And with my manager, I would say: "I've got a lot on my plate right now; I'm not sure when I will be able to get to the write-up. Do you want to change my priorities? If I stopped everything else right now, I could have it by noon tomorrow." Obviously, my new strategy doesn't require me to agree to everything. Maybe I don't like bowling. In that case, I could suggest a specific time for an alternate activity. Or maybe I really don't want to hang out with that person at all, I might just say: "Nah, but thanks for asking." Or I might tell my manager, if it's true, that I don't think I would do a good job on the write-up, and suggest a different person to ask. Or if it's just a preference, I could tell him something like: "If you need it to be me, I will do it. But if not, I'd rather stay on what I'm working on. Okay?" Besides the way that this method of handling agreements strengthens connections with people, I find it has personal benefits as well. I'm able think of myself as a responsible person. And I don't feel guilty for indirect communication. And I get much more clear about what I want, what I'm willing to do, and what I'm not willing to do. Even Well-Meaning Words Can Hurt - What Can We Do When It Happens? Have you ever heard an exchange like this? Person B. "Hey! That's not nice!" Person A. "Jeez, lighten up! I was just joking." What happened here is that Person B doesn't understand the difference between Intention and Impact. Intention is whatever result Person B wanted their words to have. In the case above, they probably wanted people to laugh. On the other hand, impact is the emotional meaning that Person A received. In the case above, Person A felt slighted in some way - probably by one of the common "isms": sexism, racism, etc. A tool I learned to work with Intention and Impact is called Ouch / Oops. I have only tried it in groups that are already close, but I bet it would work in somewhat mature teams as well. When a person receives a negative Impact, they can tell the other person: "Ouch" or: "That was an ouch for me." Person B. "Ouch." or "That was an ouch for me." Person A. "Oh, I'm sorry. What did I say that hurt? Person A. "Wow, I had no idea that what I said could be taken that way. Thanks for explaining it. Here is another version of the above example, except that when Person B points out the impact, Person A can see the problem right away. Person A. "Oh right, I'm sorry. I see what my words implied. That wasn't what I intended. Thanks for pointing it out." Person A. "Oops. That might have a different impact than I intended. I'm sorry. Let me say it this was instead: ..."
Person B. "Yeah, the first way didn't feel good. Thanks for catching it." It is important here that neither person belabor the point during an Oops or an Ouch. The point isn't to punish person A. Person A needs simply to recognize their impact and express a brief apology. From there, both people move on. Any additional apologizing or lecturing can lead to hurt. Receiving "Hey! That's not nice!" is uncomfortable. Often, a"Hey! That's not nice!" response is met with defensiveness. This could be because a part of the speaker may feel shame, and sometimes a way to deal with shame is to lash out and blame the other person. By contrast Ouch offers the possibility of the parties involved learning something and becoming closer. Being on the receiving end of Ouch may still be unpleasant, but is less likely to invoke shame. Calling "Ouch" focuses on the impact on the listener while presuming good faith on the part of the commenter, rather than implying that the commenter is mean, insensitive, or prejudiced. Similarly, with the focus on the impact received, there is less room for someone to be misjudged as touchy or over-sensitive. Oops is a way of acknowledging that the listener has valid feelings and that the speaker's words may have been received as hurtful, but that the speaker doesn't intend to hurt the listener. Like with Ouch, this offers the pair the opportunity strengthen their relationship. I've decided to really try and be consistent and blog good content on a regular basis. I am taking a free 6-part course by https://www.pluralsight.com/ instructor and author of "Soft Skills: The Software Developer's Life Manual", John Somnez. The course is written for software developers. I like the course format. It comes out twice a week. Each email has a couple of homework assignments that require real work but are doable by the next email. I am really keeping up, and I tend to procrastinate some things like this. Disclosure: Writing and publishing a post about the course is one of this week's homework assignments. It simply says to write a post about the course and include the links. I wrote the content without any input from him, he didn't see it before I published, and I don't get paid for it. I work at Pillar Technologies as a software consultant. nearly 24/7/365 for more than ten years. What other impacts do you notice when you don't take care of yourself? What other things do you consider self-care? Having integrity means that my words and actions are aligned with my thoughts/beliefs. For example: If I think the environment is important and I tell people that I am pro-environment but I over-water my lawn, create lots of plastic waste and buy beef raised on clear-cut forest fields, I am not being in integrity. Another example: I believe and say that family means everything to me, but I spend very little time with my kids, I don't share all the family tasks fairly, and I spend most of my time after work drinking and getting in trouble. Again, I am not being in integrity. The expression "The road to hell is paved with good intentions" is a way of saying that our so-called goodness depends on our actions, not merely thoughts or beliefs. That's integrity. If I become known as a person of integrity, I will be trusted with more things, and more important things at work. I will most likely be less micro-managed. If my reputation for integrity extends outside of my employer, I'm more likely to attract better opportunities, whether I am actively looking or I find myself suddenly in need of a job change. By contrast, if you become known for a lack of integrity, people will hear your good intentions but they won't trust you to do what is right. Employers might watch over your work more carefully, or lay you off in a first round. Job opportunities could become constrained, being limited to only positions where mostly doing the right thing is good enough. A closing thought about integrity: don't rely on other people's views of you to determine whether you are being in integrity. You know. When contemplating action, do a "gut check". Does what I am about to do reflect what I believe and what I say?